Welcome to our series, Common Scents. Common Scents is a collection of articles exploring the history of commonly used essential oils and how they became so popular in modern day soap and cosmetic crafting. Eucalyptus is a fast growing evergreen tree with over 700 species that originates in Australia. Eucalyptus Globulus, or the “blue gum” tree is the most common and main source of eucalyptus oil production. The “Blue Mountains” in Australia are named such because on warm days, the eucalyptus trees release volatile organic compounds that create a smog-like haze over the forests. The eucalyptus tree is also found other areas of the world such as India, Europe and South Africa. Eucalyptus creates a cooling and refreshing effect on the body and mind. At the request of Baron Ferdinand von Mueller, Victorian pharmacist Joseph Bosisto began investigating the essential oils of the Eucalyptus. 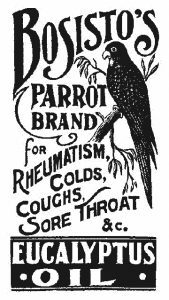 By 1852, the essential oil industry in Australia began. Bosisto built several distilleries and was know as Bosisto’s Oil of Eucalyptus and was selling eucalyptus oil all over the world. Fast forward to modern day. Have you ever checked out the ingredients listed on your toothpaste, mouthwash, or other oral hygiene products? Chances are, eucalyptus is one of the main ingredients. Or perhaps you have a fresh, crisp, almost mentholated smelling soap, lotion or scrub? Eucalyptus has become one of the most commonly found oils on the shelves of manufacturers and hand crafters alike because of its versatility. Aroma therapists use eucalyptus in situations where someone may be prone to illness due to emotional stress or anxiety because the aroma is know to dispel melancholy and raise the spirits, as well, it is also used to clean the air of negative energy that have been collected. 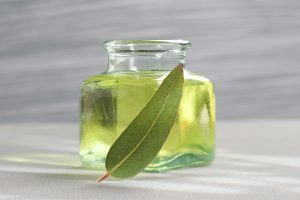 The use of eucalyptus oils is growing in popularity. One of the main reasons is because it blends well with many other essential oils including Lavender, Lemongrass, Pine Tea Tree, Juniper, Spearmint, Thyme, Rosemary, and Cedarwood, to name a few. 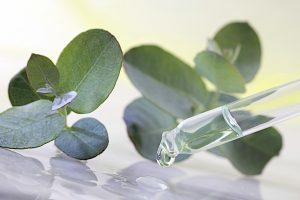 Differing from other oils, eucalyptus oil may not be as rich in history, but its value in the handcrafted and homeopathic fields out weigh many. Keep in mind, some of these claims may or may not be tr ue, it is imperative that you follow the FDA’s guidelines for labeling; this includes making claims that are not approved by the FDA. Our How-To Library contains a great podcast about labeling by expert Marie Gale; check it out by visiting: http://www.soapguild.org/how-to/legal-compliance/hscg-radio-labeling-guidelines.php.